Over the years we have been continually developing our products, improving the quality and precision that PPM is known for. We now have an expansive range of high quality materials, design features and manufacturing processes which all our customers can benefit from. We can offer our breadth of knowledge to specify materials, heat treatments, coatings and processes to further tailor components to customer specific applications. 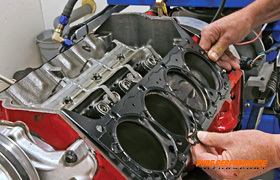 Since its inception PPM has invested heavily in the very best processes, tooling and highly skilled individuals to ensure that every customer gets a product that they are proud to put in their engine. When we first started making connecting rods for the Suzuki Hayabusa engine not many of our customers were running highly boosted set ups. With this in mind our original design was a strong, light weight design utilising 5/16" ARP bolts and all the design features you'd expect from an PPM Racing connecting rod. As the limits of these engines have been pushed more over the years we thought it fitting to produce a new design to reflect the increasing demands placed on this component particularly in highly boosted drag racing applications. We have designated this new design as our "Hayabusa Turbo" connecting rod. Our redesign now features a thicker cap and beam section for improved stiffness. The design also incorporates 3/8" ARP bolts and a larger clamping area improving the rigidly of the big end housing and decreasing the risk of bearings spinning and ultimately engine failure. With both versions held in stock you can be sure that no matter how you plan to tune your Hayabusa engine we have a connecting rod to suite your application. PPM Racing Turbo Tuff high performance connecting rod bridges the gap in the market for superior performance and exceptional strength at a price that is financially viable. Based on material research, PPM Racing Turbo Tuff is an ultra-high strength steel connecting rod with high core hardness that maintains ductility. Careful selection of chemistry and heat treatment practice gives PPM Racing Turbo Tuff a complete balance of mechanical properties and close tolerances for demanding applications. It is particularly suited to high stress usages where rod distortion can occur, such as in high boost engines.